We went on a walk last Sunday, along with about 130 others. It started in the cold, grey and wet, at a time when many of us would still be, if not in bed, certainly doing nothing much more energetic than turning the pages of a Sunday paper and slurping coffee. 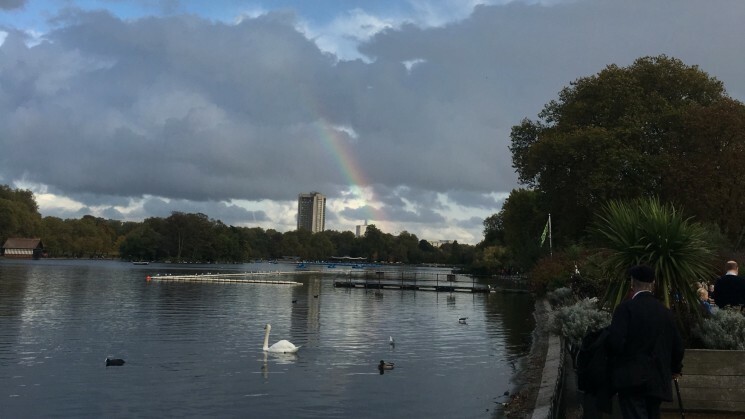 It ended in glorious early-evening light, with a rainbow over the Serpentine and, if not actual gold at the end of the rainbow, then the next best thing – cakes and prosecco. It started in Greenwich, where so many migrant stories have started in the past – George I prominently among them, borne to his disembarkation at the Old Royal Naval College aboard the ship Peregrine, but also, though much less regally, Ignatius Sancho, born on a slave ship and later a lobbyist for the abolition of the slave trade. It ended in Hyde Park, just short of the Albert Memorial, flamboyant statue to one of the most-loved migrants of the nineteenth century and the inspiration for the cluster of museums and institutions – Albertopolis – that now draw so many visitors to our capital. Not all migrants migrate from east to west of the city, of course, but it’s a useful hook to hang an event of this kind on. It’s certainly a long walk, that walk from arrival to establishment, and not all migrants make it with equal success, happiness and good fortune. And it was a long walk, literally, on Sunday, a full 15 miles and counting, which not all participants made with equal success, happiness and comfort of foot. But the overwhelming majority of those who started the walk completed it, and there was a sense of euphoric satisfaction in Hyde Park at the end of the day that may have had something to do with the prosecco on offer, or possibly with the sheer relief of the walk now being at an end – but which was mostly down to the sense of fulfilment and enjoyment of a day spent in good company, learning something about the myriad migration stories that make up the history of London, and of the multiple layers that make each street and region a palimpsest of the migratory experience: whether it’s the Brick Lane Jamme Masjid mosque, in a building that had previously been a synagogue and was, before that, a Huguenot chapel; or the building in Old Jewry, now housing the visa office for the People’s Republic of China but almost eight hundred years previously the site of the first synagogue in this country; or 25 Brook Street, home to George Frideric Handel in the 1700s and the more raucous stomping ground of Jimi Hendrix in the 1960s. Divided into groups of 10 to 15, each led by an incredibly well-versed volunteer guide and supported by one of our magnificent volunteers, we walked along the south bank of the Thames to Tower Bridge, meandered through the East End, Brick Lane and Spitalfields, wandered through empty and storm-soaked streets in the City, rising again into Clerkenwell and Holborn – passing through the world of clockmakers, jewellers, lawyers and artists, before moving westwards through Covent Garden, Soho, Kensington and Mayfair. In Postman’s Park, Bill Bingham (our very own Ian McKellen) appeared out of nowhere, surprising us with a rendition of Shakespeare’s Thomas More speech (‘Grant them removed, and grant that this your noise / Hath chid down all the majesty of England … ’), delivered (in theory) in the early 1600s to quell riotous discontent at the arrival of the Huguenots. We stopped along the way to hear the story behind particular buildings, or about individuals who had lived in that area, or whole movements of people; and in-between we talked to each other about our own stories, about plans for the Migration Museum Project, about how our country would change in the wake of the recent referendum decisions. We liked it so much we are already planning to do it again next year – at least once more in full length, and maybe on a number of other occasions, in a shorter form. And already we’re thinking, if this works so well in London, why wouldn’t it work just as well in any number of other cities: Newcastle, Manchester, Glasgow, Liverpool, Belfast, Bristol, Leicester? Get in touch with us if you want to help us plan how to extend it. Oh, and we raised hugely important funds for the MMP’s work, too. Our target was to raise £20,000 to enable us to continue delivering exhibitions, events and education work in schools as we build the case for a permanent Migration Museum for Britain. At the time of writing, we are still a little short of our target – the equivalent of finding ourselves in Regent Street, when we need to be in Hyde Park. If you would like to help us reach our target or destination, please go to our MyDonate page. Epic day with informed guides – great fun despite the rain! What a fab day! Like walking through a spread of London’s amazing history! 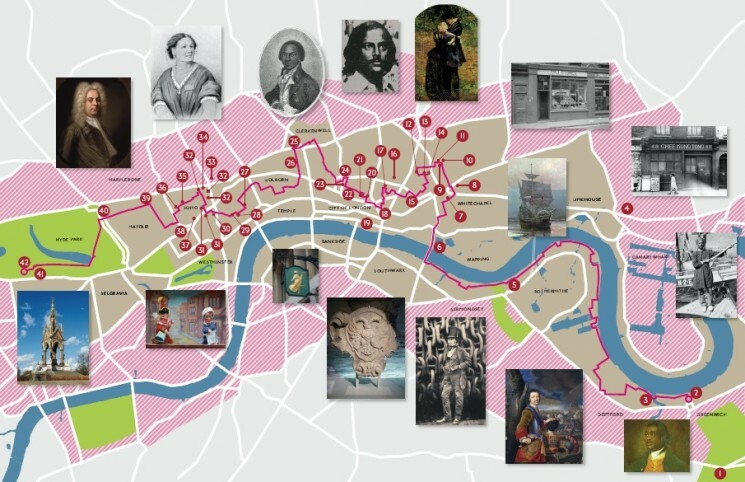 A wonderful way to explore London and discover how migration is a fundamental part of the city’s identity. I enjoyed seeing so much of London in one go, and learning about all the little histories and significances that would have gone unknown otherwise. I loved the content and it’s great to have the map as a momento. Lots of highlights that I have been boring my nearest and dearest with: Mayflower pub selling US stamps – Rotherhithe tunnel used to have shops! 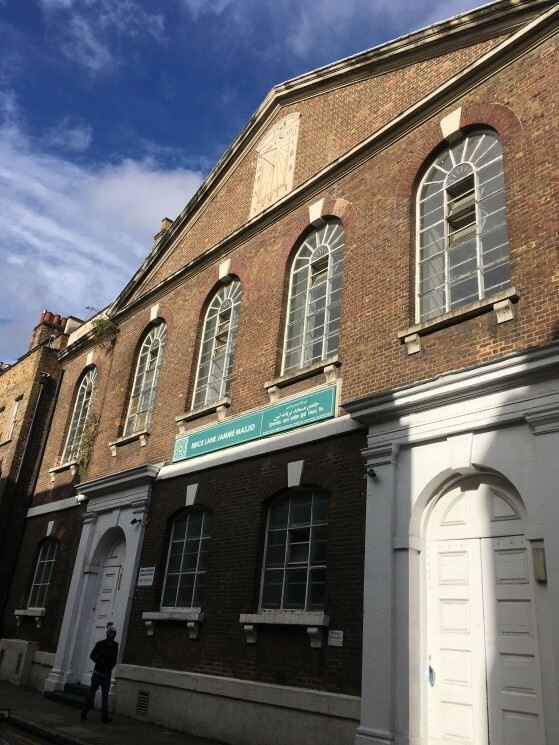 – De Hems pub history … and of course the wonderful performance in Postman’s Park, a speech which I didn’t know and now love. Very interesting, and I learned lots! Like the fact that it was easier to be black than Catholic in Tudor England! It made me think about things in a totally new way – I hadn’t thought of Paul Reuter as a German immigrant to London before! We went on a walk last Sunday. It was a huge success, raising funds and fun in equal measure. Why don’t you come on the next one we organise? 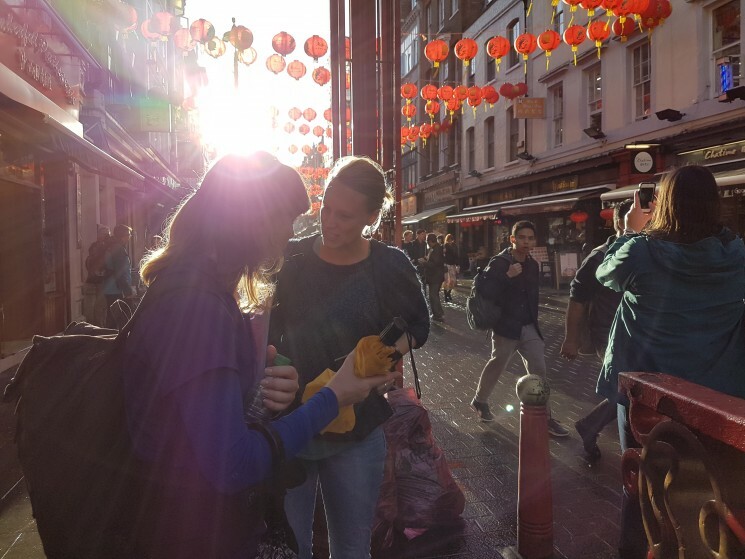 The first Imprints: London Migration Walk took place on Sunday 16 October 2016. Huge thanks to our team of volunteer guides, all of whom were mines of information, wit and inspiration – and to the volunteers who supported them. Without you, this project would be struggling! But the biggest thank you goes to the 130 participants who so good-naturedly and energetically gave up their Sunday to support us on the walk, and did so without complaint, even when the skies emptied their load on us in the early afternoon. Thank you, thank you, thank you. Here’s to the next one!